Attunity is a leading provider of big data management software solutions that enable access, management, sharing and distribution automation and analysis of data, including Big Data, across heterogeneous enterprise platforms, organisations, and the cloud. Attunity has supplied innovative software solutions to its enterprise-class customers for nearly 20 years and has successful deployments at thousands of organisations worldwide. Move the data that moves your business. Agile Data Warehousing & Data Lake Pipeline Automation. Analytics for enterprise data warehouse optimization. To manage growing volumes of data today you need to rapidly enable data for analytics in heterogeneous environments. Traditional data movement tools are slow and require manually coded commands that can tie up your best programmers. Attunity Replicate delivers a modern alternative. It moves data at high speed across all major source and target platforms through a single “Click to Load” interface that completely automates the end to end replication process. Administrators and data architects can easily configure, control and monitor bulk loads and real-time updates with enterprise-class change data capture capabilities, and can even “hadoop out of the box” without ever writing a single line of code. 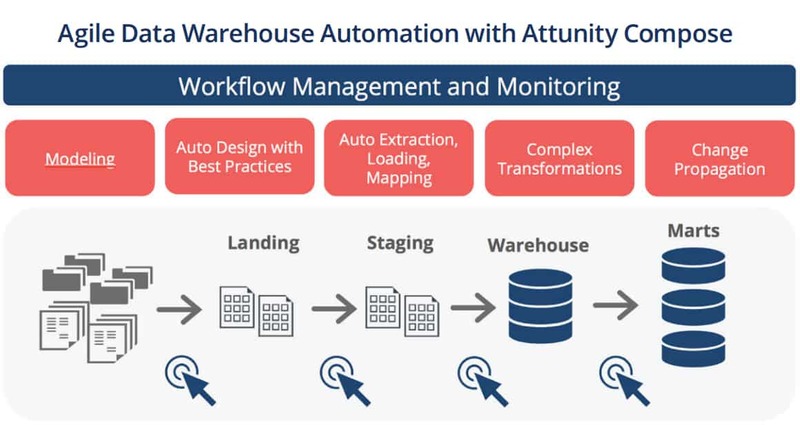 The latest release of Attunity’s agile data warehouse automation software helps speed up analytics projects, optimise development and ETL processes, and reduce risk. Compose 3.0 brings a series of significant enhancements to the software’s ETL capabilities, resulting in a 10-fold increase in ETL processing speeds. New advanced DevOps processes (in development, testing, acceptance and production) streamline data warehouse design, development and rollout processes. Also new is advanced version control, integrated with enterprise source control systems, for rolling projects back to earlier versions. And Compose improves team collaboration, enabling multi-user development projects by supporting concurrent development of models, mappings and data marts. Attunity Visibility provides analytics for enterprise data warehouse optimization and management across multiple platforms, including Hadoop. With Visibility, enterprises can completely analyse workloads and data usage across platforms to reduce costs, optimize performance and justify investments. Visibility continuously collects, stores, and analyses all queries and jobs generated by end users and applications against your monitored systems without disruption. These queries are correlated with data usage and database performance metrics in the Visibility Repository. The Visibility web application provides detailed and comprehensive usage and performance metrics for your entire data warehouse and Hadoop environments.